The new law passed by the Israeli Knesset can be a dangerous precedent for the expansion and legalization of Israeli settlements on Palestinian land, and the eventual annexation of large swathes of the occupied West Bank. 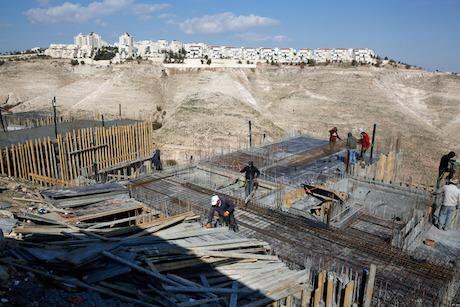 Construction underway in the settlement of Ma'aleh Adumim near Jerusalem. Picture by Xinhua SIPA USA/PA Images. All rights reserved. The recent resolution passed by the Israeli parliament (Knesset), which seeks to introduce an amnesty for some 50 Israeli outposts built illegally in the West Bank, is likely to further exacerbate relations between Israel and the European partners, but succeeds in conveying a clear message to Donald Trump, whose administration, recently established, has not yet outlined its policy on the Israeli-Palestinian conflict. Voted with a narrow majority (60 to 52 out of a total of 120 members), the parliamentary decision retroactively legalizes the homes of about 4,000 settlers, whose residences were erected on private Palestinian land and are considered illegal even under Israeli law. The law was strongly supported by the religious nationalist right-wing party Jewish Home (HaBayit Hayehudi) - today in a joint government with Netanyahu’s Likud- and was presented to parliament by the rising star of the settler movement, Shuli Moalem Refaeli. Many believe the law could be a dangerous precedent for the expansion and legalization of Israeli settlements on Palestinian land, and the eventual annexation of large swathes of the occupied West Bank. The Palestinian Authority (PA) and the Executive Committee of the PLO expressed anger over the bill, with Hanan Ashrawi and Saeb Erekat both openly labelling it "legalized theft". Leading non-governmental organizations such as the Israeli B'Tselem and the American PeaceNow, the liberal voice of the American Jewish community and a sworn enemy of Prime Minister Benjamin Netanyahu, aired their indignation and disappointment, as did many European chancelleries. British prime minister Theresa May, during a private meeting with Netanyahu a few days after it was passed, labelled the law - according to reports from Haaretz - "harmful", adding that it "could make the relations between Israel and its friends in the world more difficult". French Foreign Minister Jean-Marc Ayrault called on Israel to "withdraw the law by honouring its commitments", saying it dealt "a further blow to the two-state solution." The head of European diplomacy, Federica Mogherini, also criticised the law, arguing that it crossed “a new and dangerous threshold that by legalizing the seizure of Palestinian properties and effectively authorizing the confiscation of privately owned Palestinian land in occupied territory”. “Should it be implemented”, added Mogherini, “the law would further entrench a one-state reality of unequal rights, perpetual occupation and conflict. The EU urges the Israeli leadership to refrain from implementing the law and to avoid measures that further raise tensions and endanger the prospects for a peaceful solution to the conflict." The European Union concerns were epitomized by the postponement, until further notice, of the bilateral meeting between European countries and Israel –allegedly set to push further the moribund peace process- scheduled for February 28. But the final strike, and perhaps the most unexpected, came from one of the staunchest supporters of Israel behind the US, Angela Merkel's Germany. A German Foreign Ministry spokesman said that the new legislation "disappointed" the German people and has "shaken our confidence in the commitment of the Israeli government for the two-state solution”. According to the recently appointed UN Secretary General, Antonio Guterres, the new Israeli law "violates international law and will have important legal consequences for Israel”. The new legislation seems to be specifically aimed at counterbalancing the Security Council resolution 2334, which has been judged by many as the final blow of Barak Obama administration - for years at loggerheads with the government of Benjamin Netanyahu - and urged Israel to "cease all activities" in the occupied Palestinian territories including east Jerusalem, labelling the occupation "without legal validity" and "dangerous to the peace process”. The new law has also split Israeli society itself. According to a survey from the Institute for Israeli democracy, 53% of Israeli Jews believe that Israel should not annex parts of the West Bank, while only 37% said they were in favour. Furthermore, 50% of the same sample does not agree with recent statements issued by some members of the nationalist right, who believe that with the ascendancy of US president Donald Trump, Israel has "entered a new era" in its relations with the US, which will facilitate the expansion of new settlements in the West Bank. The introduction of the law, which would represent the first episode of Israeli civil law applied in the West Bank (where the Israeli military law is currently in place) since 1967 – the year Israel seized the West Bank and began its military occupation of the territory - will introduce a one-year freeze on the evacuation orders for 16 Israeli outposts. Under the new law, Palestinian landowners will allegedly be given an alternate plot of land or will be paid an annual usage payment of 125 percent of the land’s value, as determined by an assessment committee, for renewable periods of 20 years. But even if the Supreme Court votes down the bill, it will still remain a “win” for Netanyahu. The compensation clauses have puzzled many, as the value of the land, in fact, would be assessed by an Israeli government committee. Furthermore, the chance for a Palestinian to receive an alternative piece of land appears to be very remote. As a matter of fact, only around 20% of the West Bank is under Palestinian administrative control which includes the most densely populated areas and very little lots of arable land. For the moment, Netanyahu has remained quiet. According to some Israeli analysts, he plans to discuss the new law during the meeting with Donald Trump set for February the 15th, and exploit the special relationship with the US from a vantage point. One day before Netanyahu’s meeting with Trump, CIA director Mike Pompeo met with Palestinian President Mahmoud Abbas in Ramallah. This unprecedented visit, was allegedly meant to brief or reassure the Palestinian Authority on the Israeli PM’s visit and talks with the new American president. The tactic of raising the bar before a summit meeting with a new occupant of the White House is not new for the Israeli leader. In fact, if The Donald puts a “veto” on the new legislation, Bibi will only have to wait for the Israeli Supreme Court’s decision, which will probably give a negative opinion on the law after nearly twenty Israeli and Palestinian NGOs have filed an appeal stating that the law is not only contrary to international law, but also incompatible with the Israeli legal system. Netanyahu will have just to support the position of General Attorney Avichai Mendelblit, who has already stated that in case of a “nay” vote, he has no intention to defend the law before the Court. But even if the Supreme Court votes down the bill, it will still remain a “win” for Netanyahu. He can easily free himself of the potential defeat in front of his electorate by unloading the blame on the US and Europe and prove once again to be a first class politician on an international scale: wily, ruthless and with a very clear vision and strategy – characteristics and qualities that every politician around the world would trade his/her mother for.